On this boot only: Order 1 FULL SIZE UP from your regular fitting shoe size. i.e: If you are a size 9 tennis shoe, order the size 10. 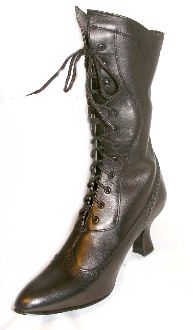 BLACK LEATHER WOMENS Western old style boots. * Available in MED width. * From heel to toe of this boot on a size 10 = 10"